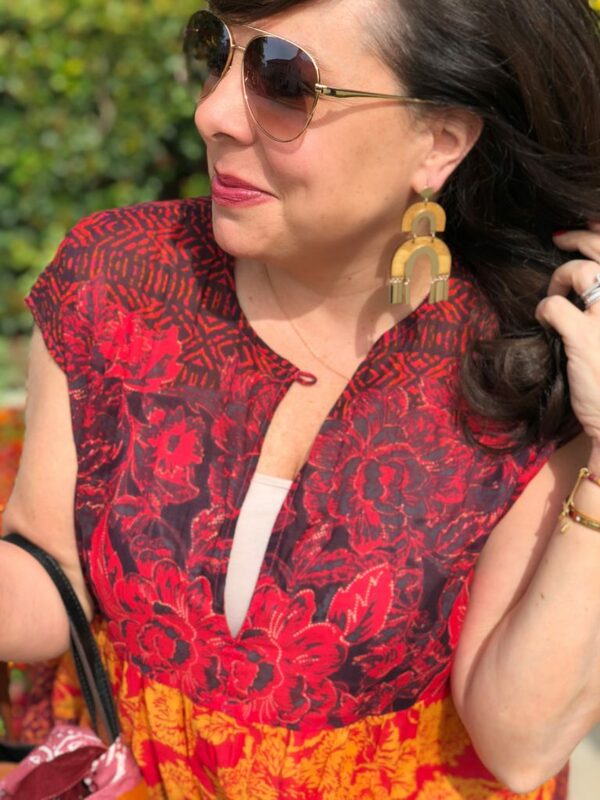 I’ve got lots of great pieces in today’s post including some fabulous earrings, necklaces, and bracelets…and we’ll of course talk about all of them. 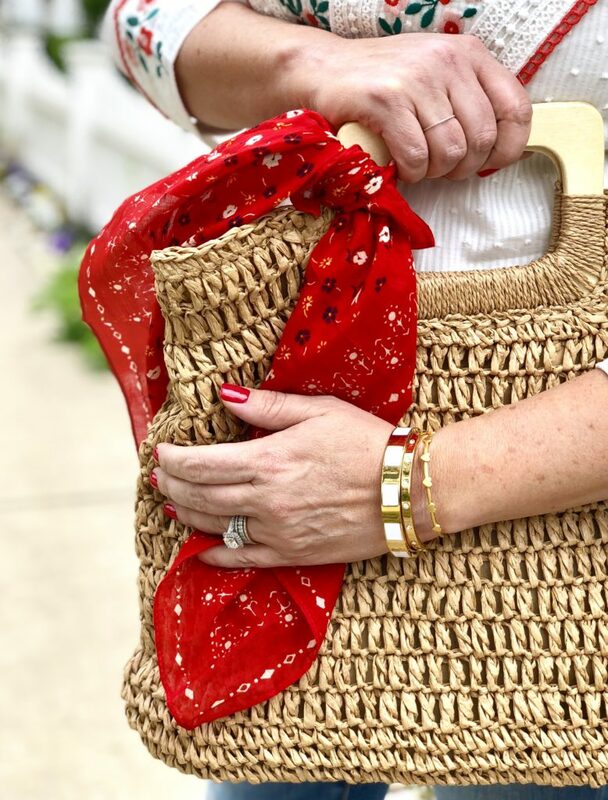 But the stars of today’s post are bags and bandanas. What’s that? Did I hear a collective “HUH? BANDANAS?” coming from the crowd? Bandanas are back baby! 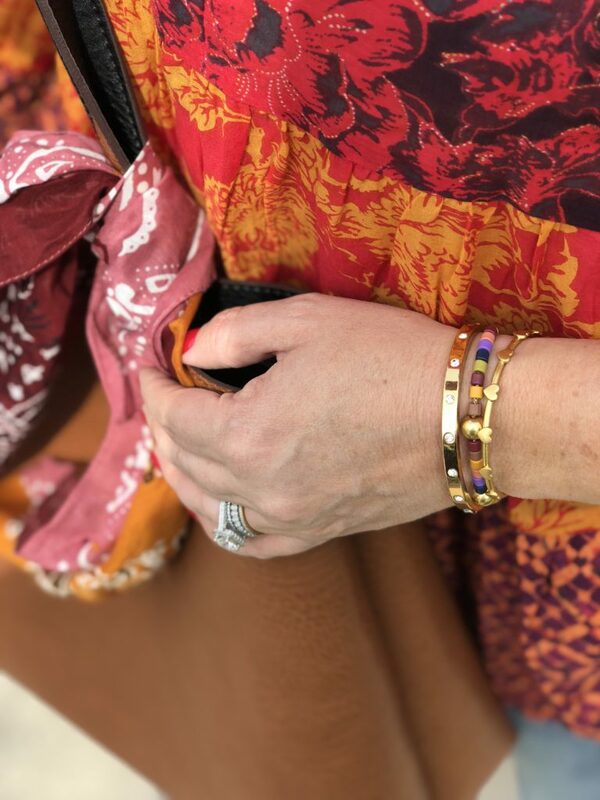 And even if you don’t want to wear them around your neck or in your hair, I’ve got a great way for you to incorporate them into your wardrobe. I ordered 3 bandanas (all under $13 a piece), and I’m having the best time using them in my outfits. So how am I using them? 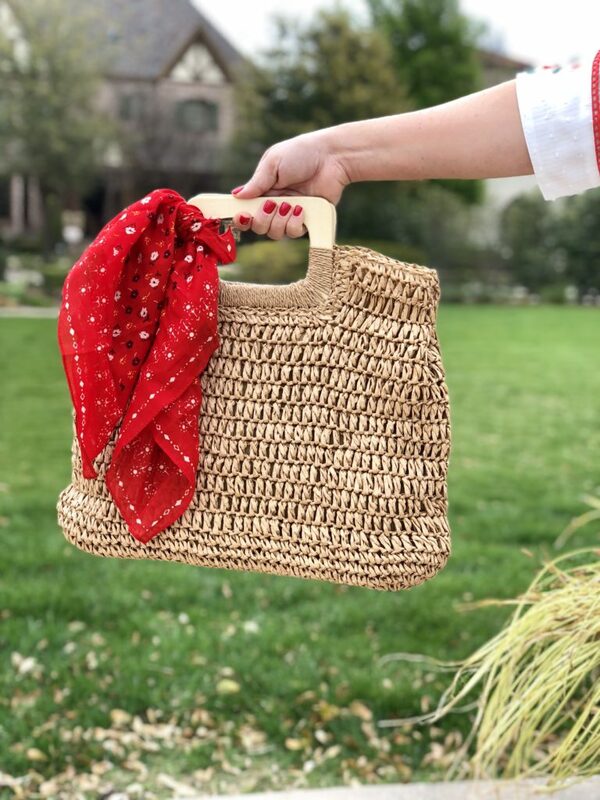 I’m simply tying them on the handles of my bags, and you won’t believe how much impact they have on your overall look! 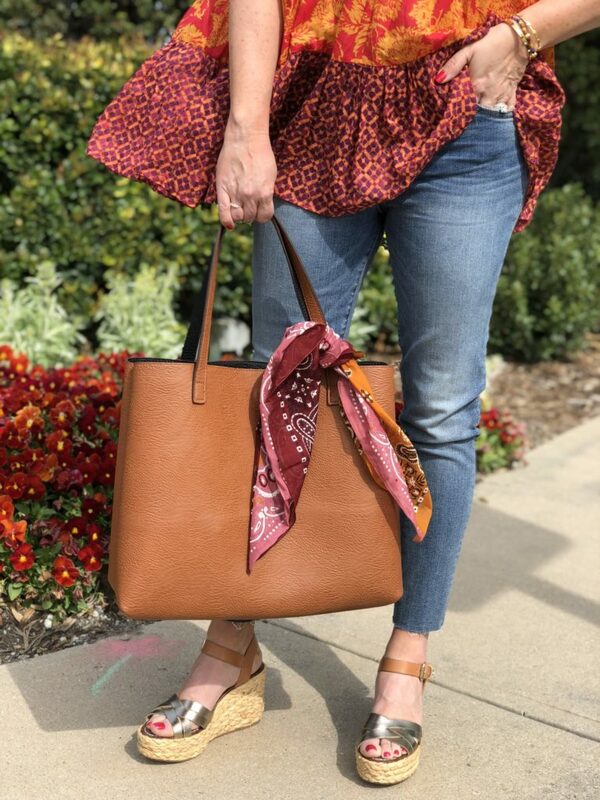 Look how much style this UNDER $10 bandana adds to a simple cognac tote!!! The whole outfit is totally boho chic, and I love it. 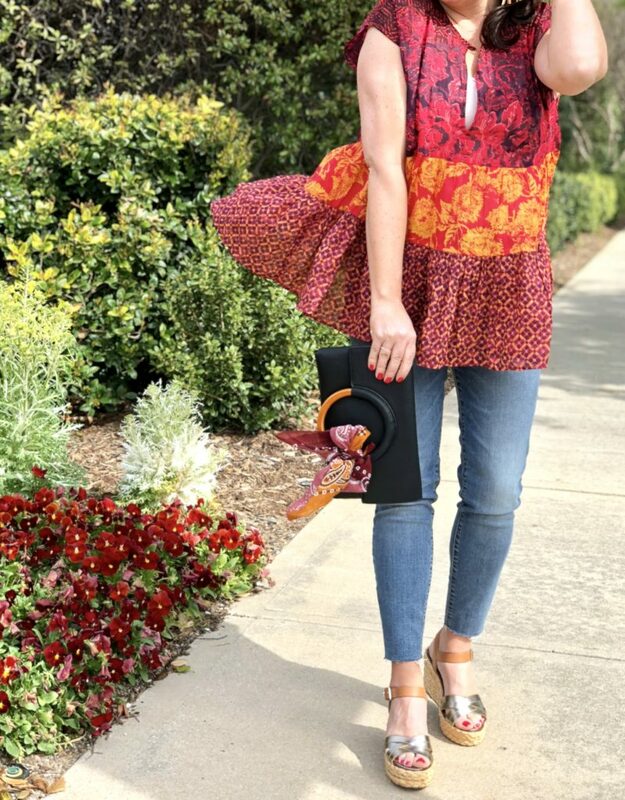 The colors in this Free People tunic are absolutely gorgeous, and I love how it’s tiered and has a peplum feel. The material is thin, light, breezy, and will be great all summer long. I’m wearing an x-small, so I would say it runs quite large. Size down at least 1 size. (This would even be great on those of you that have a baby bump.) Also, I’m wearing my favorite cami under it because it’s definitely too low cut to wear without one. The top comes in 2 additional colorways that are just as pretty and interesting! 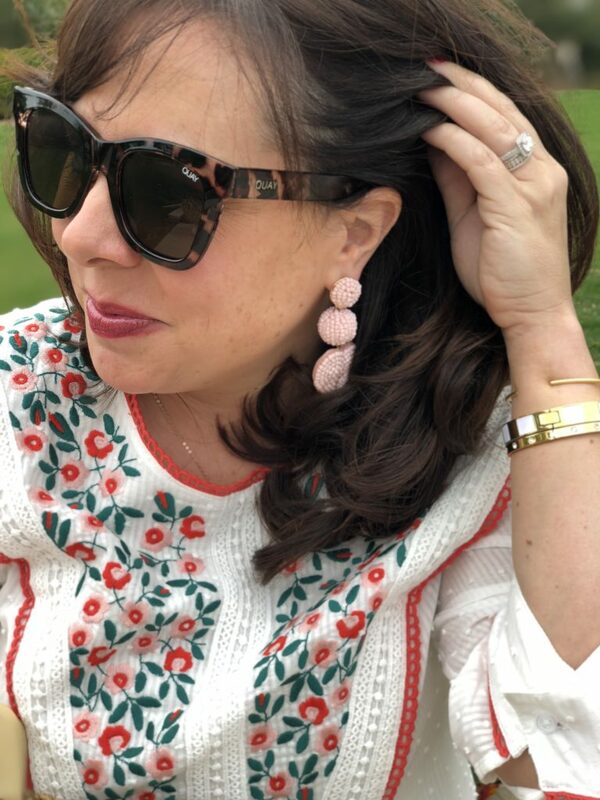 The earrings and the sunglasses are both fantastic deals. I’m wearing my favorite lipstick in this shot. Click HERE for my recent makeup post to see what it’s called. The blingy gold bracelet is a bracelet I’ve had for years and still love. The other two bracelets are new and great for stacking! How sweet are those tiny hearts. 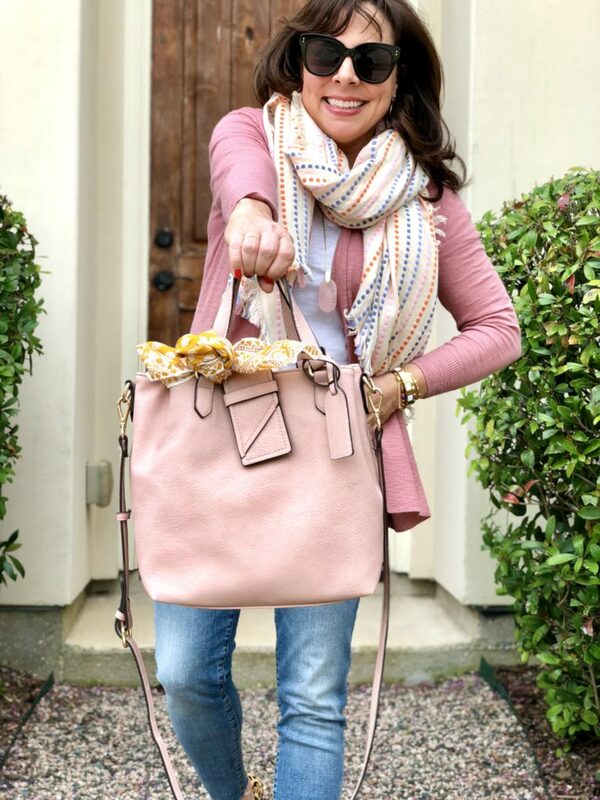 Okay, time to talk about the tote. I first talked about it in my travel outfits post at the beginning of this year and you’ve seen it several times since then, so you might remember it. It’s reversible (cognac or black), just under $50, and it holds my 15″ laptop. 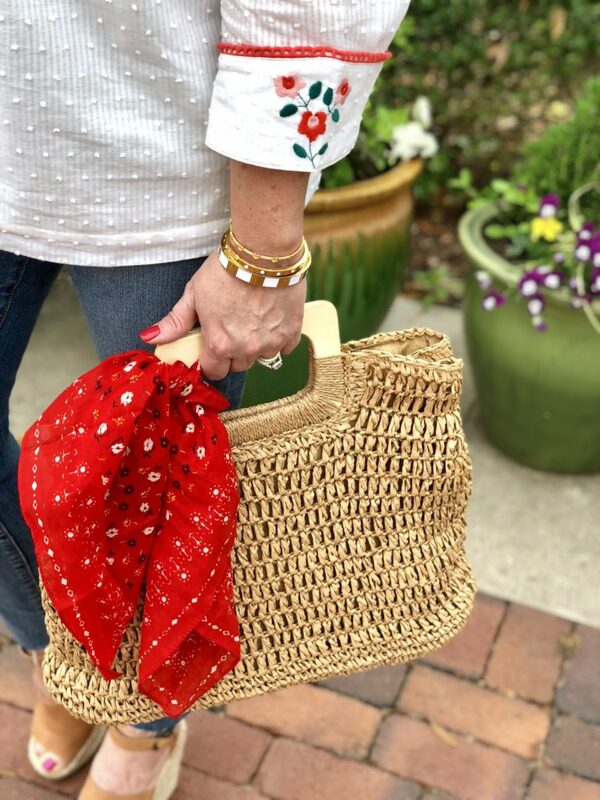 This bag is great for travel, but it would also make a wonderful and super affordable work bag, or just an everyday bag. 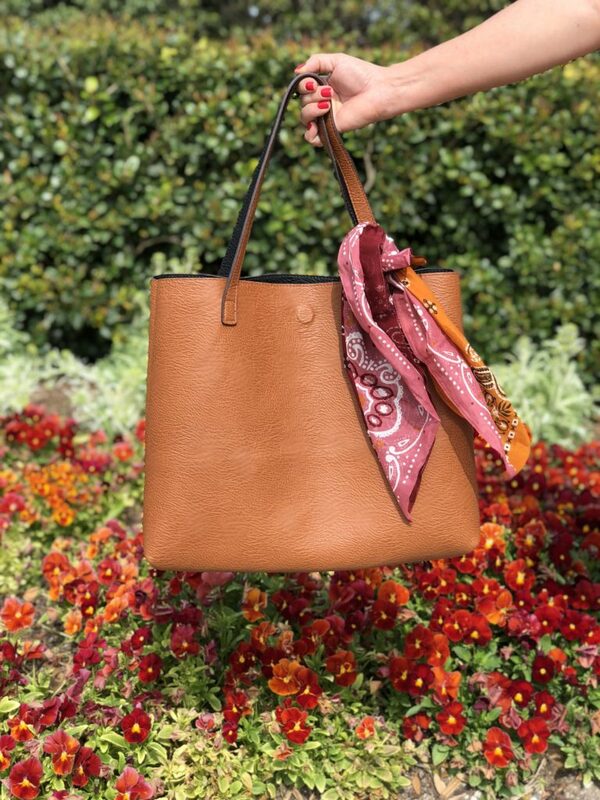 And the bandana tied on the handle adds just the perfect amount of flare! The jeans are my higher waisted raw hem skinny jeans that I’ve been talking about for the last several weeks. 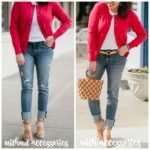 Click HERE if you want to see them styled in several different outfits. Click HERE to see my post from last week where I compared my 3 favorite KUT jeans. I also wanted to show how cute the little bandana could be tied in a bow on this clutch too. The wooden ring provides the perfect spot! 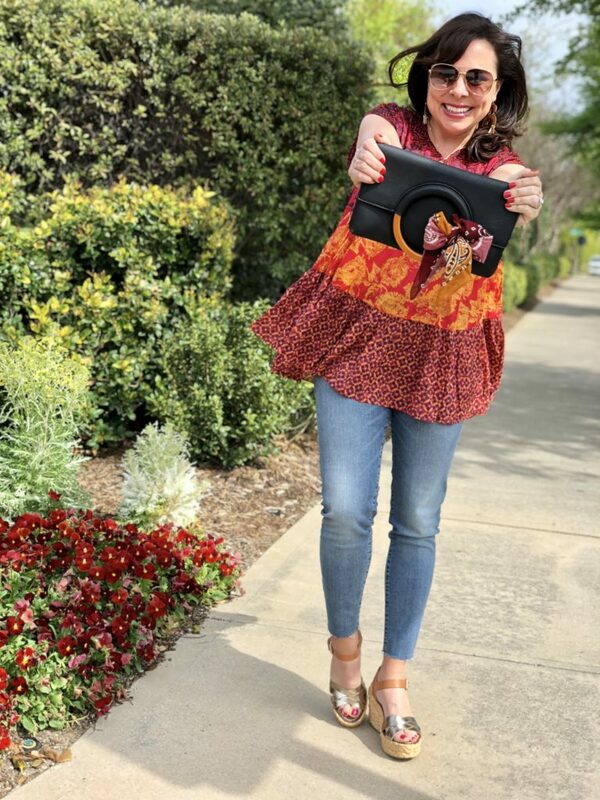 Same outfit, but with the clutch instead of the tote. 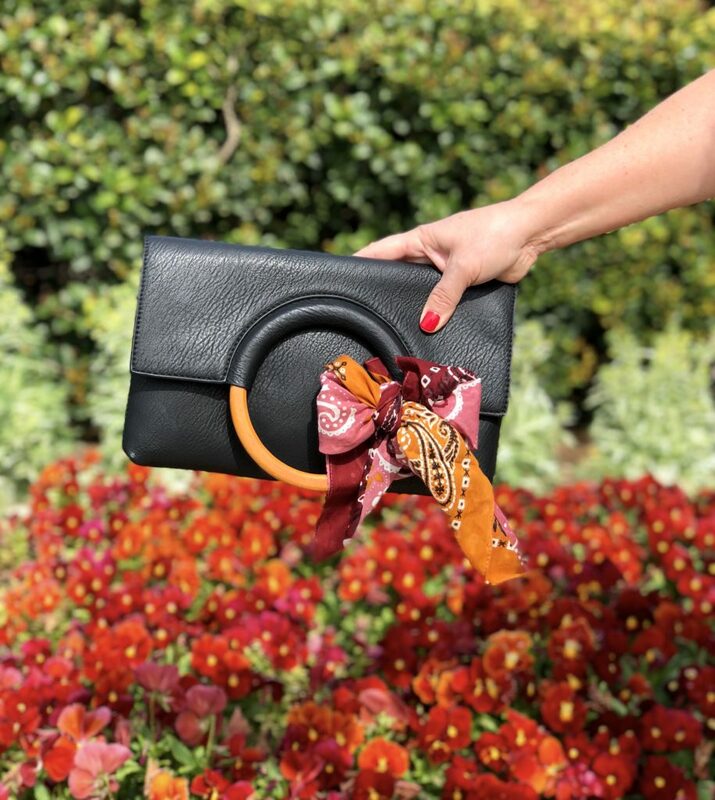 The clutch just dresses it up a tiny bit. I got this clutch last year, so I was very excited to see them bring it back for everybody that missed it the first time around. It’s a fantastic deal at under $30, and it comes in coral and white too. 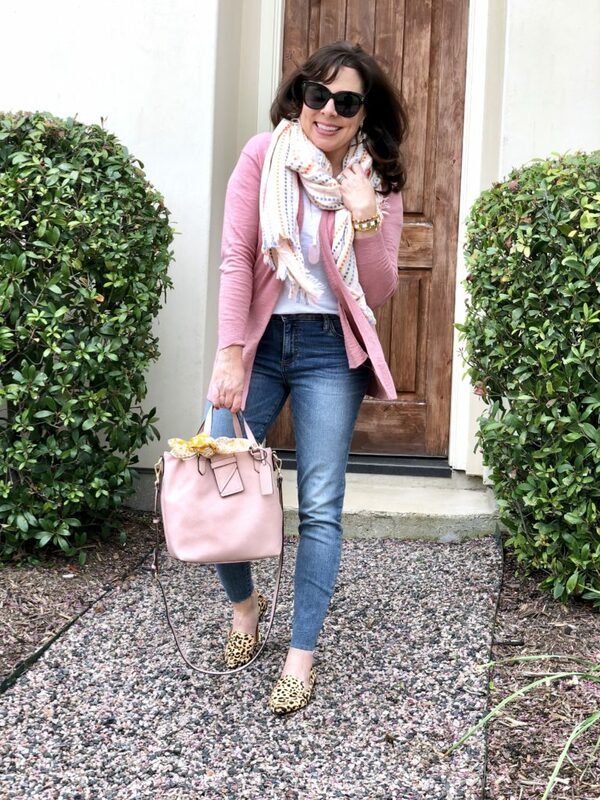 The jeans are the perfect length on me to show just a tiny bit of ankle with wedges or flats. 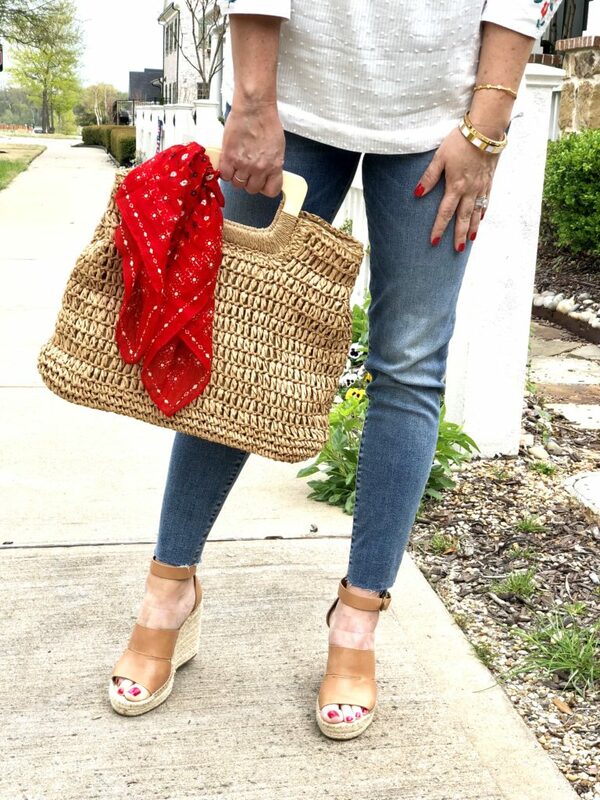 These espadrille wedges are DARLING. They are a wonderful neutral with sass because of the gold and the unique espadrille style wedge. The gold isn’t a really bright and shiny gold, it’s a more muted brushed gold (which I prefer). And the braided rope detailing on the wedge gives them great flair! They are comfy and easy to walk in, most likely due to the tall platform under the toe that makes you feel steady on your feet. The wedges are true to size for me, but if you are sometimes between sizes, I would suggest sizing up a 1/2 size. Next up…this awesome satchel with a great red bandana tied casually around the handle. I fell in love with the square shape, the raffia like material, and the wooden handle. 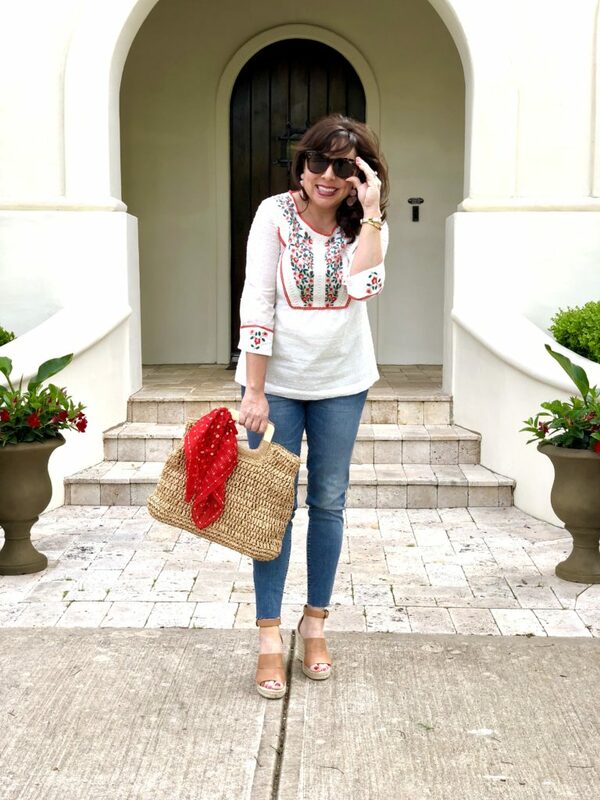 Look how perfect it looks with this embroidered top! I found this top while browsing online, and it’s one of those items that immediately went in my cart. I fell in love with it instantaneously. The bright and vibrant embroidery is beautiful and so well done on both the bodice and the sleeves. And the red trim is such a nice finishing touch. The bodice is fully lined and the entire top is covered in sweet little swiss dots. 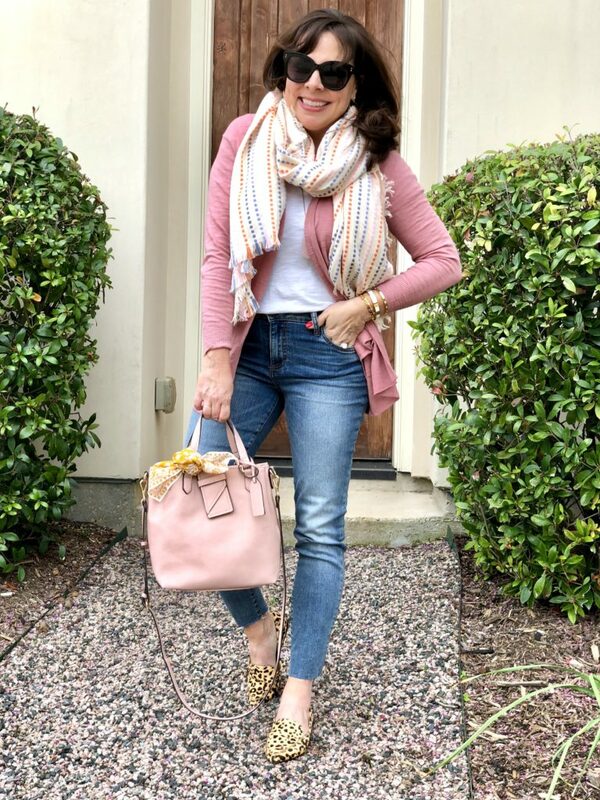 I thought the beaded heart earrings were a great pop of pink to accent the pink in the blouse.. You first saw the earrings in a couple of different outfits in my statement piece 3 ways post, and I’m still finding new outfits to wear with them! They come in red and a mixed metal as well. The red bandana was the obvious choice for this outfit, but it does come in 6 other adorable colorways/patterns. Looking to add a new bracelet or two to your stack? I’ve got some great choices for you today. I’m wearing Quay sunglasses, but my particular color is no longer available. 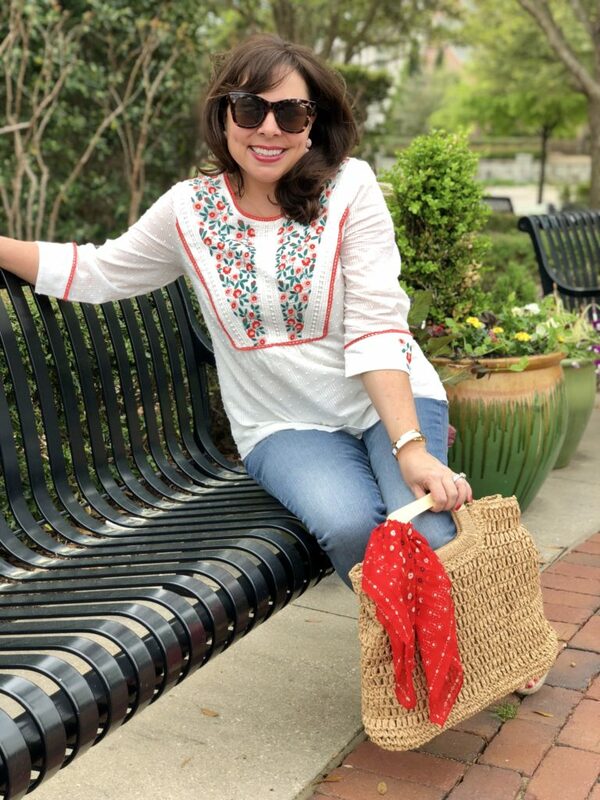 You can click HERE for similar sunglasses that are only $16! I tell ya what, BP really hits it out of the park with inexpensive sunglasses (that definitely have a designer look)! Some of them are even a little “too designer” for me, if you know what I mean. I have 3 pairs of varying styles and colors, and I think they are all awesome. I’m notorious for losing my sunglasses, so inexpensive sunglasses are totally smart for me to have! Don’t you just love how the sleeves are embroidered too? These wedges are my favorites. They are true to size for me, but some readers that have wider feet have said that they sized up 1/2 a size. They are easy to walk in, look great with a variety of outfits, and are reasonably priced at just UNDER $80. Oh, and one more thing. They are DARLING. 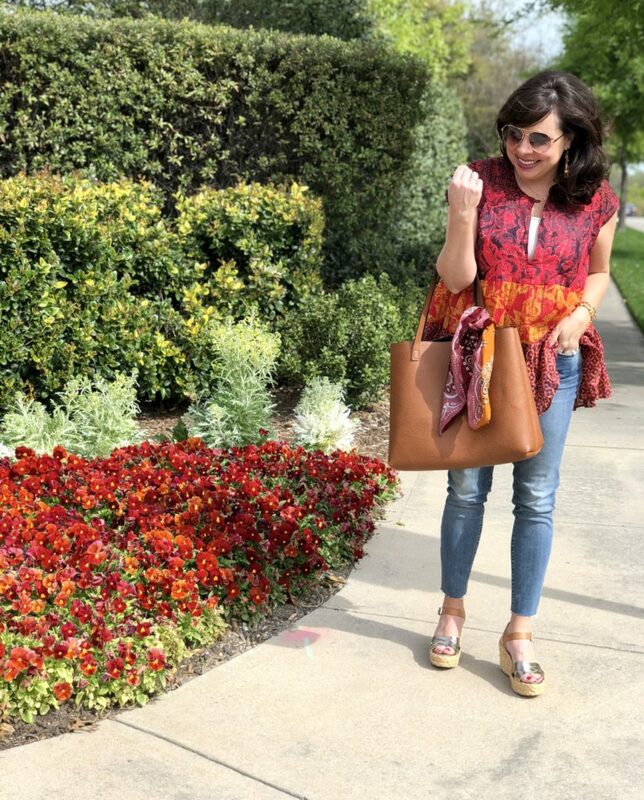 Click HERE for the post where I named them a must have in March last year. When they released them again this year, they added 7 new colors! They have 590 reviews, and almost all of them are 5 STAR! 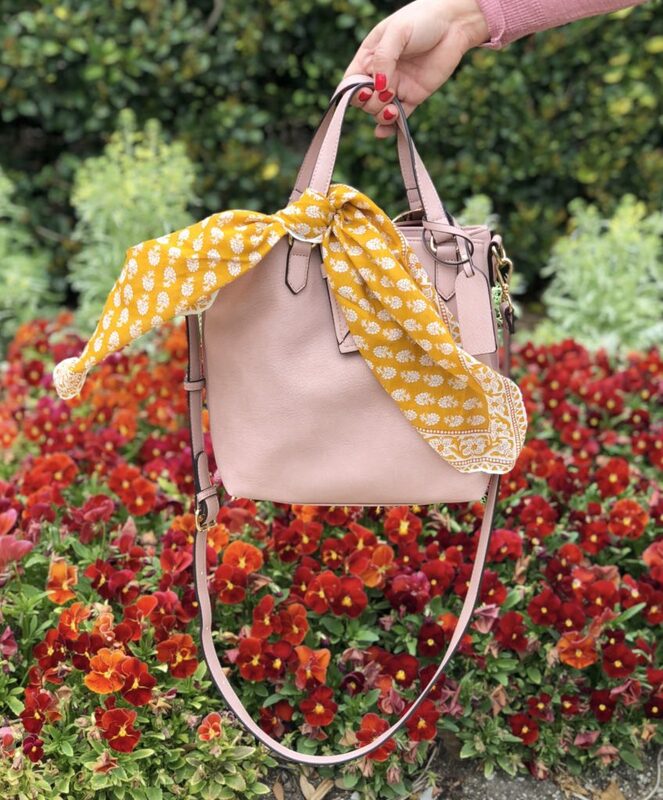 A blush bag with a mustard bandana. Yes, please. I started out simple with this outfit. 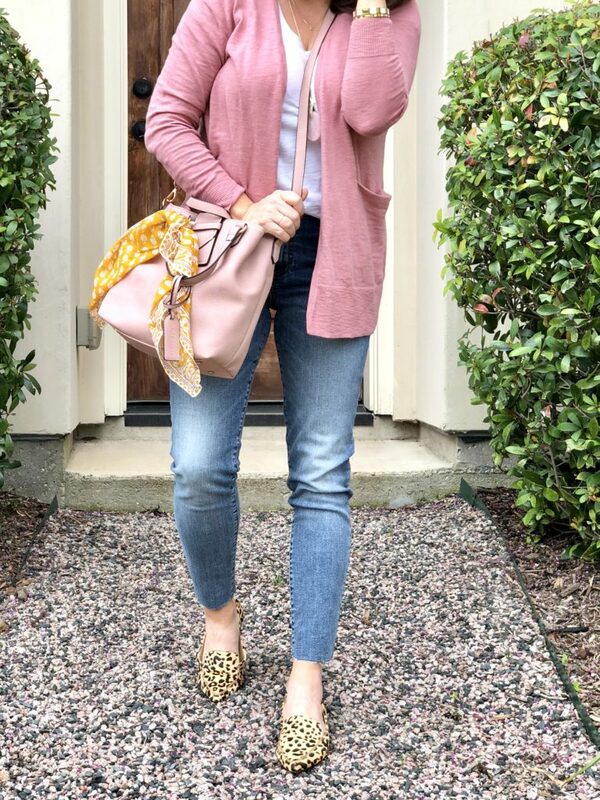 Just a tee, cardigan, and blush necklace (hiding behind the bag strap). 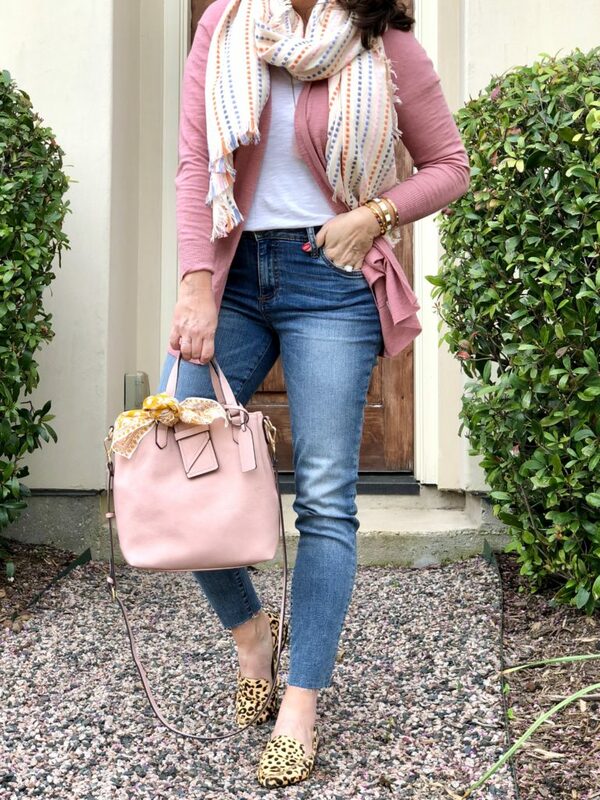 I liked how the outfit was simple and tone on tone with the cardi and the bag. 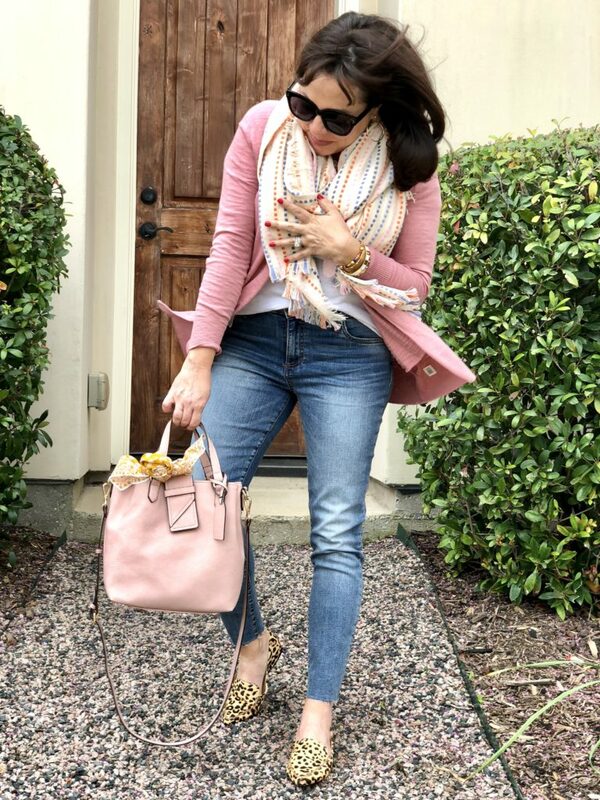 But I LOVED how the mustard bandana and leopard flats gave it a whole lot of personality! And then I kicked the overall look up a notch with this scarf. And because I was adding so much material with the scarf, I was afraid the bandana might be too much on the bag. So, I tied it up into a type of rosette (basically just a tighter knot without long tails) to make it compete less with the scarf. It still added great color, but it wasn’t distracting. Let’s talk about these higher waisted raw hem skinny jeans First of all, don’t worry…they’re not too high. They’re just the right amount of high waisted. I kind of think of them as an aggressive mid rise, if you will. Ha! 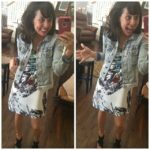 Click HERE if you want to see them styled in several different outfits. 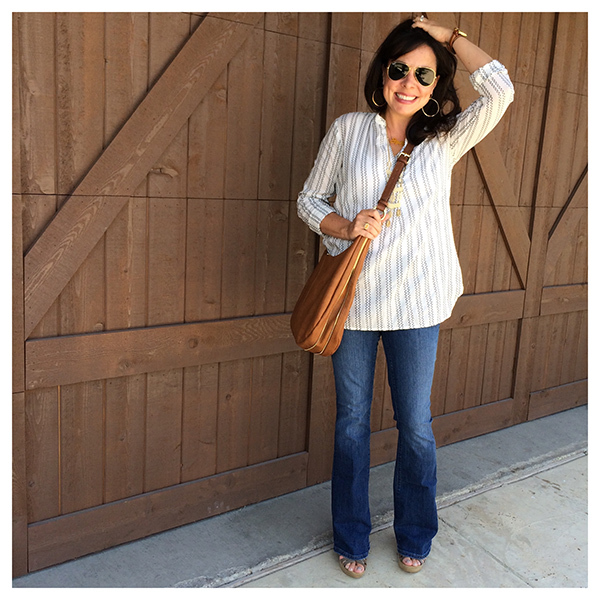 Click HERE to see my post from last week where I compared my 3 favorite KUT jeans. 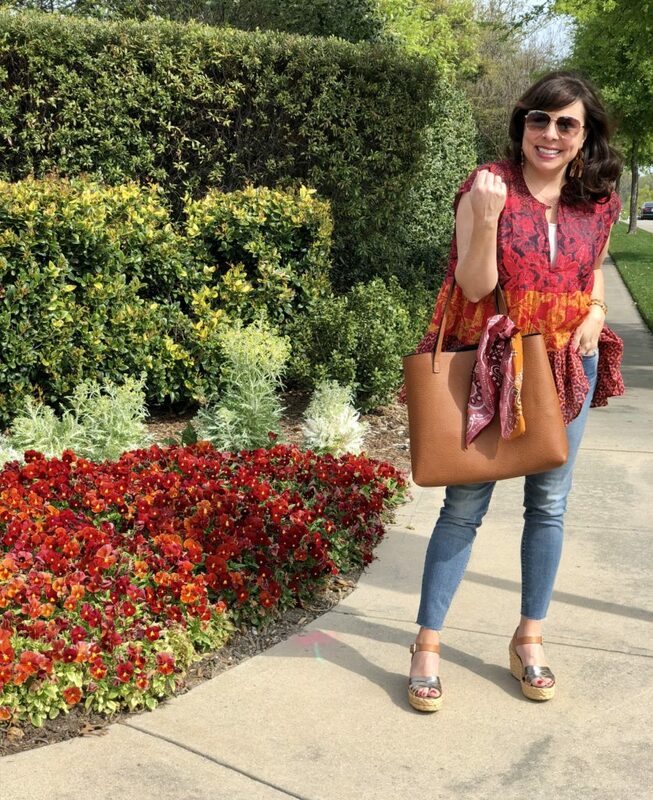 The flats are one of my favorite purchases so far this year, and I bet they make it to my 2019 Top 10! 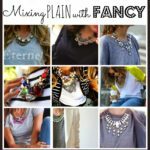 Click HERE if you want to see them styled several different ways. And I actually liked the look with both the necklace and the scarf. 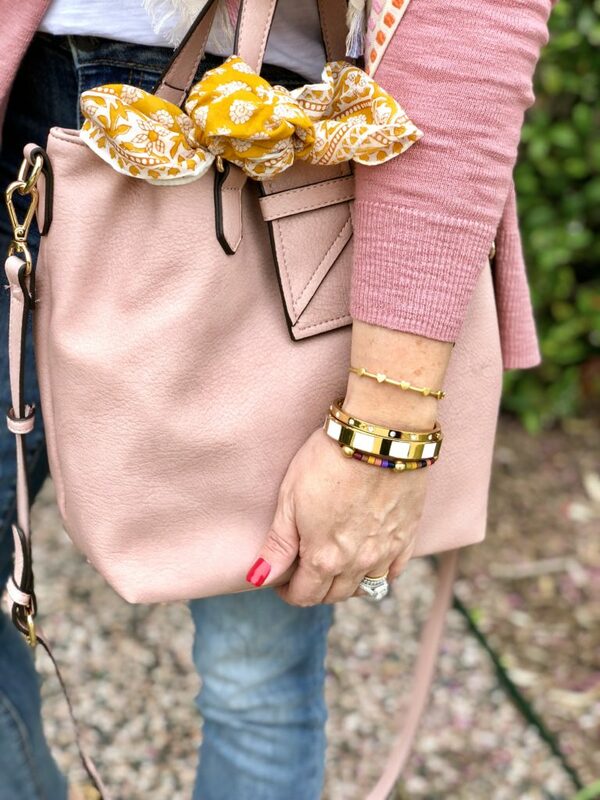 Don’t be afraid to pair these two types of accessories together. I absolutely love the blush and yellow together. And how cute is the little bandana knot? And my arm party game is strong. Love the scarf. Love the bag. 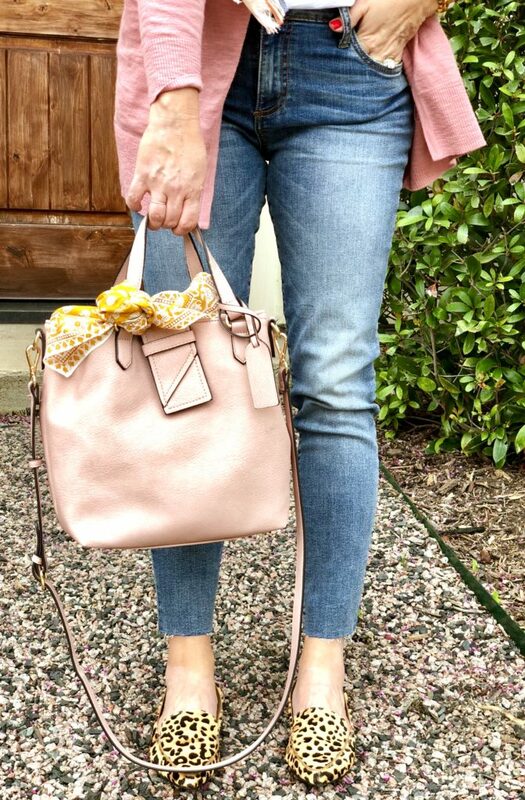 Love the colors, Love the jeans, Love the shoes. That’s it for today, ladies! I hope you were inspired, and I certainly hope you grabbed some accessories. At the very least, a cute little bandana to up your style game! 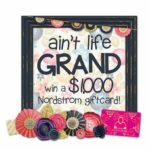 A huge THANK YOU to Nordstrom and ShopStyle for sponsoring this post. Five on Friday! 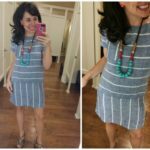 A Great LOFT sale and Lots of Discount Codes! How cute is that combo?! Love it!! The bandanas are adorable! So cute and what a fun addition! Love! It’s my birthday too, so I always remember! Hope you have an amazing day! P.S. i love love love this post! This is my style! I always thought bandanas were just for Western Day BUT you just proved me wrong!! I just lol’d! Aren’t they cute?!? Everything was SO cute today, and you looked great in everything! Very clever about the bandannas. I am having to restrain myself from ordering everything. Sigh. These are so cute! Have you tried tying one around your neck? The photos on the models look so cute but I’m not sure I could pull it off at my age. I love tiring bandanas to my purse! I especially love the mustard bandana. I ordered a tank top from madewell with the same striped color. You knocked it out of the park! How lovely and oh so my style! Happy Birthday too! Oh my goodness…so many cute outfits. 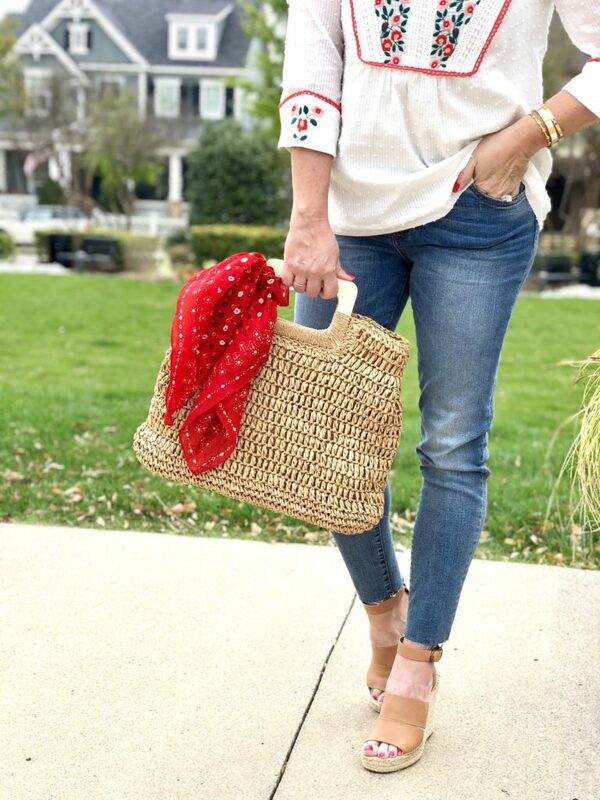 I am loving the bandana craze for a pop of fun. These bandanas add the perfect pop of color and fun! And happy birthday to you!!! Hope you have the best day today! How are the BP wood earrings? Are they light? 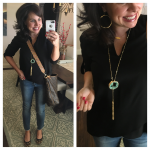 Love the shape…and the whole outfit! Happy Birthday Sheaffer!!!!!! 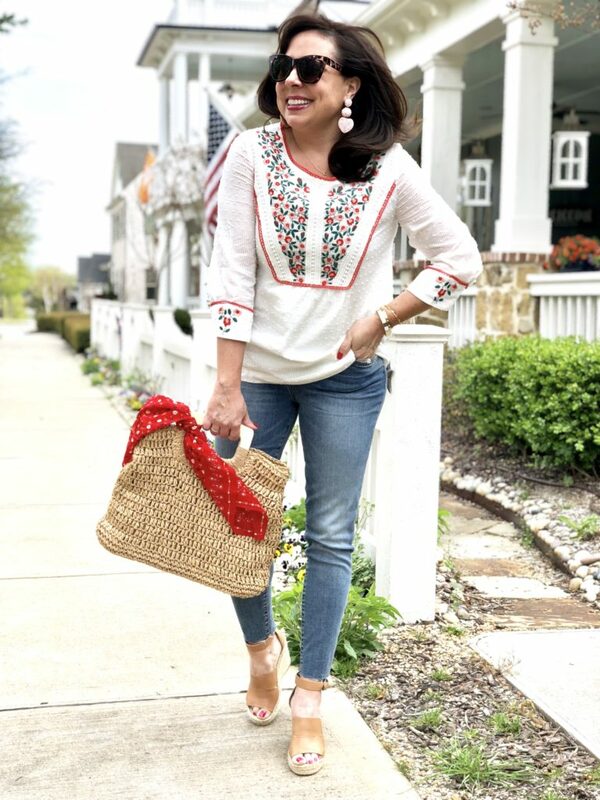 you make it all look so cute and easy.. maybe I can pull it off too… I ordered the Sam Edelman espadrille wedges from Lord + Taylor at 40% off last week and I have worn them 4 times already… I LOVE THEM!!! HAPPY BIRTHDAY!!! I didn’t know that bandanas are back in style. Thanks for the heads up! So much great info. Also let’s talk about your triceps. Daaaaaayum!!! 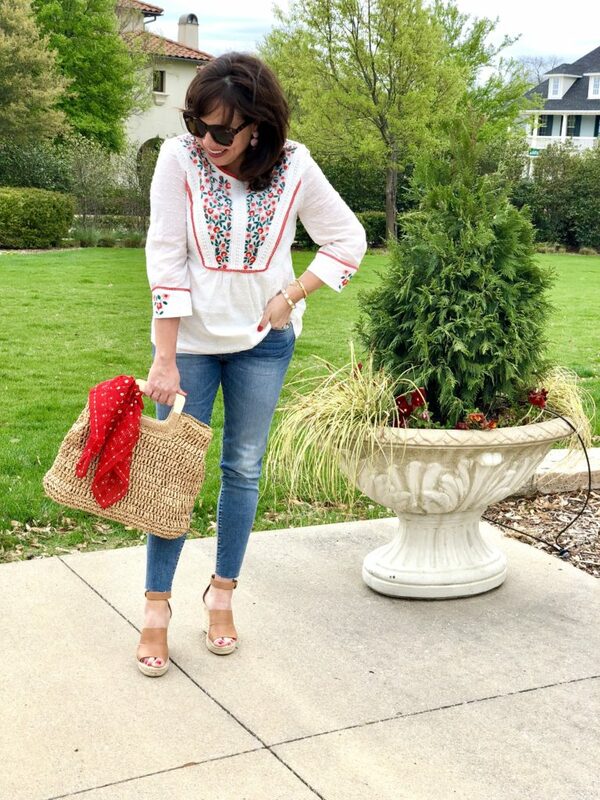 What size are you wearing in the Boden embroidered top? In my experience they run smaller….thanks!